Our first release of 2018 included customer service improvements, updated integrations, usability enhancements, a new email receipt format for voided (cancelled) transactions, and a number of improvements for our API integrations with various management software companies. ClickPay supports users having multiple properties and multiple payment methods within their ClickPay wallet (aka “account”). Having multiple cards in your “wallet” can get confusing if payers use one card more than the other(s). 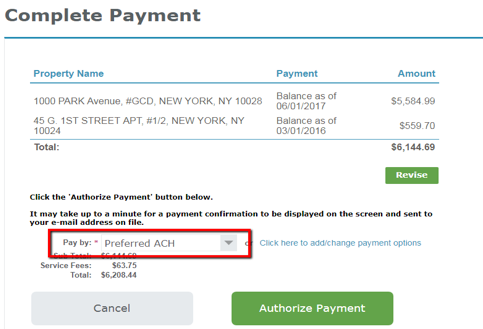 With this in mind, ClickPay released the ability for users to indicate and customize their “preferred payment method”. This preferred payment method will always appear at the top of your list of payment options to simplify and expedite the payment process and avoid confusion. Now users can continue to checkout with one click, and avoid any delay associated with selecting your favorite credit card or primary bank account from your ClickPay wallet. ClickPay’s Online Bill Pay solution is unique in the marketplace. We have programmed ClickPay to integrate with the originators to scan the biller networks for your payments and integrate them into your management software. This month, we worked closely with the biller networks to improve the way that we communicate rejected payments back to payers. 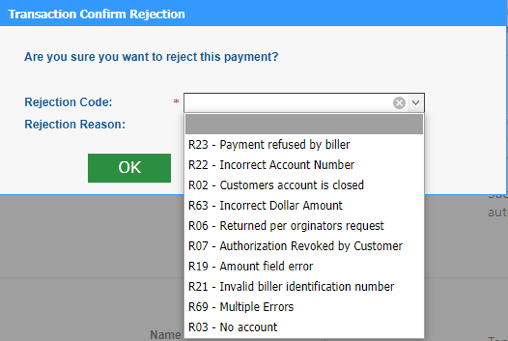 In the case that a payer is on DNA, or has not provided enough information to post a payment, our new integrated rejection messages allow clients to clearly indicate to the payer why their payment was rejected, streamlining the communication process, and supporting prompt corrective actions. Customer service remains ClickPay’s first priority. With that in mind, we are rolling out a new IVR system to support and improve payments accepted by phone. Unfortunately, like paper checks, phone payments will still be some residents’ payment preference. Our IVR system is human-assisted, to aid the customer in a secure but friendly, PCI compliant IVR payment experience. Our goals are to support customer convenience (they can pay whenever they want), faster access, security, and control. Our new IVR leverages our powerful technical integrations to create a seamless payment experience. ClickPay IVR payments come with ClickPay’s industry leading data encryption and tokenization in order to protect private financial information. We are excited to release this feature and are looking forward to the feedback from our clients and residents. As part of our continuing effort to support ClickPay as a leading provider for integrated payments with third party real estate applications, we continue to release improvements to our payment API. In a continuing effort to streamline this process, we have released improvements to our internal service components and 3rd party user integration. What this means is twofold. First, our partners can clearly identify and populate the details of the payer, simplifying and streamlining the payment process to avoid payers having to re-enter payment methods each time they visit. Our verification tools allow the partners to leverage ClickPay’s PCI compliant environment and tokenization process, while supporting users’ preferences for a quick and secure payment experience. Secondly, our improved service components now allow our team members across departments to better identify and respond to any questions regarding integrated payments and creates a broader understanding of our integrated payments and associated reporting. What this means for you is clearer and more intelligent communication and payment receipts in real-time. Stay tuned for new features in the coming months! We’ve updated our integrations with Caliber Management Software and Village Management Software (VMS)!